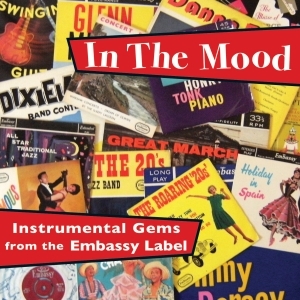 The Embassy label occupied a unique place in the British pop scene of the 1950 & ‘60s, releasing cover versions of current pop hits which were sold exclusively through the Woolworths chain of stores, and their recordings have become increasingly collectable in recent years, to the extent that Acrobat have released complete collections of the 45rpm singles from 1960, 61 and 52. However, Embassy also made EPs and LPs which covered a wider spread of repertoire to take advantage of the presence they had in stores which addressed the mass market. This included instrumental material of all kinds, including their covers of instrumental chart hits, and this collection pulls together 32 examples of their top quality recordings, usually made by the top session musicians in the British industry, released under a variety of identities. It makes for very enjoyable listening, as well as being a collectable snapshot of their eclectic output from that era.